You can read plenty of detailed accounts of Union Rags’s gallant trip in the Champagne Stakes (G1) at Belmont, in which he was bottled up and altered course several times before breaking through to a 5 1/4 length win. The effort proved he has the guts and ability to overcome trouble, a trait that is invaluable in the full fields of the Breeders’ Cup Juvenile and Kentucky Derby. What you won’t read is any concern of the toll the race took on the young colt. While it wasn’t the roughest of trips, he did check several times and you have to wonder why Castellano rode the horse so hard once he was clear and even beyond the wire. Early reports indicate Union Rags came out of the race well and cleaned his feed tub. The workout tab leading up to the Breeders’ Cup should tell us more. If there are any skipped weeks or laborious visual cues or times, it may warrant considering other contenders with more value. If he doesn’t miss a beat however, he’s my pick for the winner and eventual 2 year-old Champion. 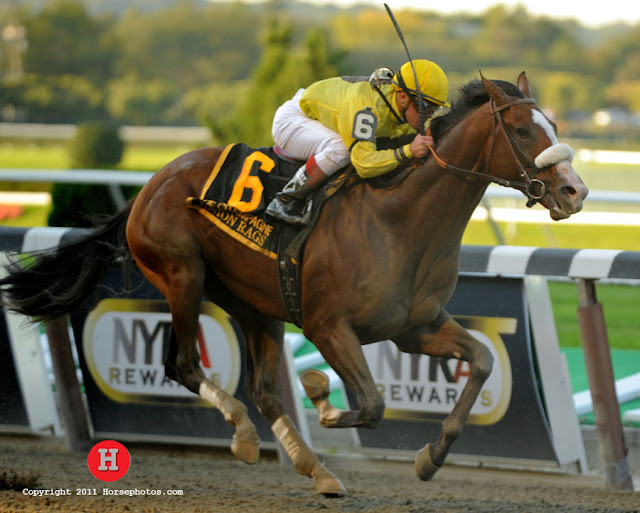 You can read more on Union Rags’s pedigree from the Aug 16th entry here. Alpha finished second, which is admirable especially considering it was just his second career race and still appeared somewhat green by taking awhile to get engaged. Dullahan, a 17-1 longshot maiden, began the Dixiana Breeders Futurity (G1) near the back of the pack under a strong hold from jockey Kent Desormeaux. The new tactic paid off for him, but was much aided by the quick pace up front set by Musical Flair, Ancil, and Majestic City. Desormeaux guided Dullahan on the outside and started aggressively working on him before the winning stretch run. The big question will be where Dullahan goes next. He earned a trip to the Breeders’ Cup Juvenile, but his past performances suggest he’s better suited to polytrack or turf. His two maiden special efforts on dirt were a 3rd and 5th place finish by a combined 16 lengths back. Majestic City NP hung on for a second place finish only passed by Dullahan in the final strides, which was an impressive performance considering he was involved in the brisk early fractions. His next move will also be interesting considering his dirt and distance questions. The footsteps of upset Kentucky Derby winner Mine That Bird were also felt Sunday at Woodbine, in the annual running of the Grey Stakes (G3), a race he won in 2008. The 2011 edition was conquered by Prospective, the 4th choice on the board who had only a maiden special win on his resume. Settling just behind the pacesetters, Prospective handled the 1 1/16 miles very professionally by pulling away when it meant the most. Trainer Mark Casse swept the trifecta with Lockout and Bluedacious finishing behind the winner. Casse said Lockout and Prospective are headed to Louisville, although the exact Breeders’ Cup juvenile race was not mentioned for either. Unfortunately, Sunday’s Bourbon Stakes at Keeneland was most notable for the freaky occurrence of Here Comes Frazier bolting over the rail. Fortunately it appears the horse will be ok, although his racing career is most likely over. Jockey Julien Leparoux passed the MRI on his arm with flying colors and will resume riding at Keeneland this week. As for the winner of the Bourbon Stakes, Animal Spirits ridden by Robby Albarado took the outside path for his well-measured score. He was yet another juvenile who broke his maiden in a graded stakes. Trainer Al Stall was non-committal on next race plans but the Breeders’ Cup Juvenile Turf seems to be the logical race. Animal Spirit was a $50,000 Keeneland Yearling purchase. He’s the son of Arch, who sired last year’s Breeders Cup Classic winner Blame. On the dam side he shows just as much promise and long distance capabilities. The dam Pennant Champion is a full sister to three stakes winners including Our Emblem who was the dam of 2002 Kentucky Derby winner War Emblem. Animal Spirit’s sales page can be viewed here.